135, rue St.-Dominique, in the 7th Arrondissement. Lunch and dinner Mon–Sat. No reservations. 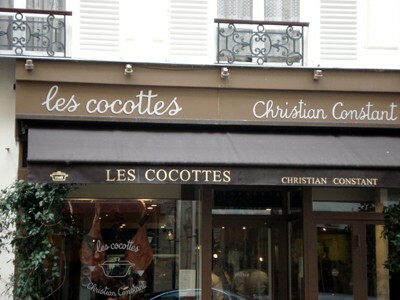 The concept of Les Cocottes de Christian Constant may be a bit of a gimmick, but the food is definitely not. Most everything on the menu is served in cast-iron cookware (“cocottes”) by Staub, which, along with wine glasses engraved with the restaurant’s logo and cookbooks by M. Constant, are displayed on the shelves behind the bar and are available for purchase. I had to wonder, walking into a restaurant full of merchandise, if the chef was also selling his soul. The answer seems to be no. And even if he were, it would be hard to judge him. Constant has, after all, trained and inspired a generation of chefs, including Yves Camdeborde of Le Comptoir and Thierry Breton of Chez Michel. Constant’s impeccable kitchen at Les Cocottes, in the hands of Philippe Cadeau, turns out thoughtful, unpretentious food in short order. Though there’s not a greasy spoon to be found in this modern space of grass green and gray, the long counter and quick pace of the service are reminiscent of an American diner, as are the no-reservations policy and the friendliness of the serveuses with the lunchtime regulars. It’s a little ironic, then, that the only major misstep I encountered here was “la vraie salade de César Ritz” (“Caesar salad” to you and me), an American invention. It was a gloppy mess of chopped lettuce—no whole romaine hearts here—coated with a thick, bland dressing that lacked any zip of garlic or lemon. 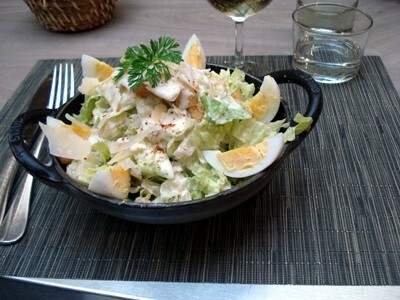 Caesar salad at Les Cocottes. No matter. Have a Bourgogne aligote from the short wine list and start with pumpkin soup instead. If a salad is in order, skip the Caesar and choose the poached egg and lardons, a copious pile of mixed greens topped with a trembling white cloud waiting to be pierced. Keep it simple with a plate of jambon Ibaïona from pork legend Eric Ospital, or try the more elegant langoustine ravioli. Desserts are straightforward. The waffle with salted butter, caramel and whipped cream is solid if a bit boring (order the half portion! ), but Constant’s fabuleuse chocolate tart is an all-but-guaranteed crowd-pleaser. Kind of like the restaurant itself. Price check: First courses are in the 8 to 15 euro range. Mains run from 14 to 24 euros. In a nutshell: A fun and breezy address with reliable food and no price gouging, Les Cocottes handily solves the “where to eat near the Eiffel Tower” dilemma. 9, Carrefour de l’Odeon, in the 6th. 01 43 29 12 05.